After yesterday’s warm spell, drier and more seasonable air filters in across New England today as a Canadian cold front passes through. This cold front will also usher in some strong to locally damaging winds across the region. Locations like Boston, Windsor Locks and Rutland, Vermont have already recorded wind gusts of 40 miles per hour or greater since 5:00 am. There have also been a few reports of downed trees scattered across southern New England. Today features improving skies and decreasing temperatures with high temperatures reaching to near 50 degrees before temperatures fall. Mostly clear skies tonight as colder air mass filters into the area with lows will bottom out in the mid to upper 20s south and mid teens north. Strong winds diminish as the night progresses. Mostly sunny skies are on tap for tomorrow with highs in the upper 30s to near 40 degrees. Tomorrow, an arctic cold front drops down from the International Border late afternoon into the early evening. Expecting some light snow showers with a few of them becoming heavy. Conditions in any heavy squall will result in brief poor visibilities and covered roadways. Temperatures tomorrow will reach into the mid to upper 30s across the south and in the low 20s across the North Country. 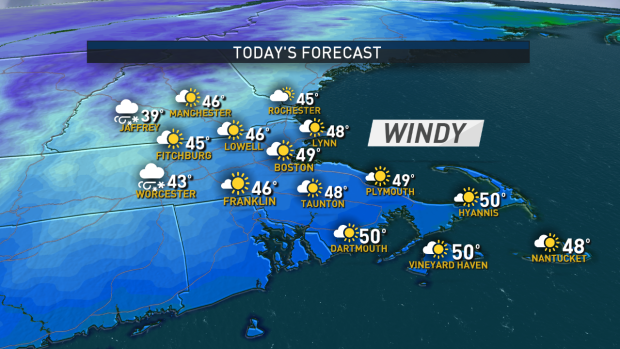 Sunny and unseasonably cold weather will be in place for the weekend as a high pressure system moves into New England. Expecting temperatures to struggle to get out of the 20s on Saturday with gusty northwest winds blowing 30 to 40 miles per hour. Sunny skies continue into Sunday with highs cresting above freezing in the mid 30s. The next storm system approaches for the start of the work week, bringing increasing clouds and some rainfall. Watching for heavier rains moving in Tuesday into Wednesday.